Remember the Stoneman Douglas High School shooting in Parkland, Florida, mid-February 2018? The one where a former expelled student opened fire at a school killing 17 students and staff members and injuring 17 others? The one that launched the March for Our Lives movement? Yes, that one. 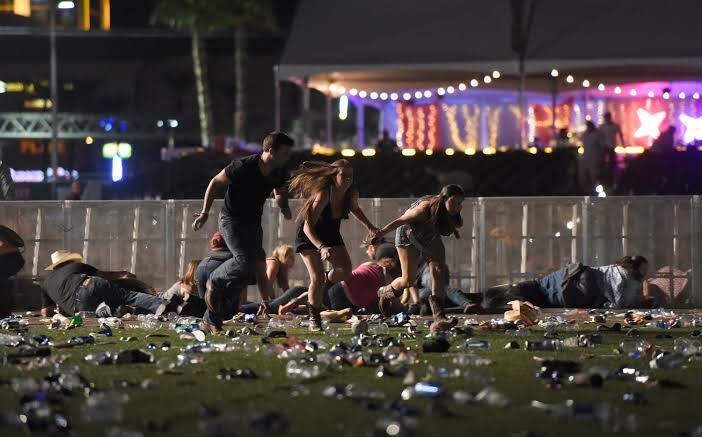 It was the 29th mass shooting taking place in the USA since the beginning of 2019. Let’s repeat that: it was the 29th mass shooting of 2018. Allow that to sink in for a while. Between January 1st, 2009 and May 21st, 2018 there were 288 school shootings in America, 57 times more than in Canada (2 school shootings), France (2 school shootings), Germany (1 school shooting), Japan (0 school shootings), Italy (0 school shootings), and the UK (0 school shootings) combined. Does this mean America has a gun problem? Probably, yes. Do they have gun control policies in place? Absolutely not! Gun control policies violate 2nd Amendment Right. The video below gives a small overview of the stark differences between gun control policies in Japan and the United States. Looking at Japan – why do these policies work in Japan? Okay, so it is safe to say that something like voluntarily giving up guns will  NEVER happen in the United States. Japan also reduced gun violence through their police. Police are allowed to carry guns, but there are restrictions. It is very unusual that a police officer will use the gun and they have to learn martial arts to themselves and others. Although they do not carry guns, the police visit gun owners at home once a year to make sure the guns are kept properly. 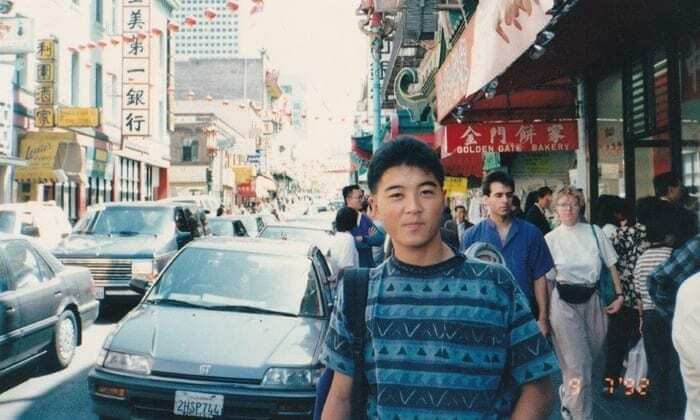 In October 1992, in Louisiana, a Japanese exchange student named Yoshihiro Hattori (16 years old) went into the wrong house on the way to a Halloween party. The homeowner’s wife screamed for help and the homeowner drew his .44 pistol and yelled at Yoshihiro to ‘freeze’. Not understanding the American idiom that translates to ‘Don’t move or I’ll shoot’, the student continued advancing towards the homeowner. The homeowner pulled the trigger and fatally shot him. While the incident initially attracted only brief attention in the national American press, the shooting horrified Japan. As a result, hundreds of thousands of Japanese citizens signed petitions calling for the United States to implement gun prohibition. The homeowner was later on found not guilty of manslaughter. The incident was huge in Japan and caused great commotion. In the US on the other hand, it was a minor incident that was quickly forgotten. 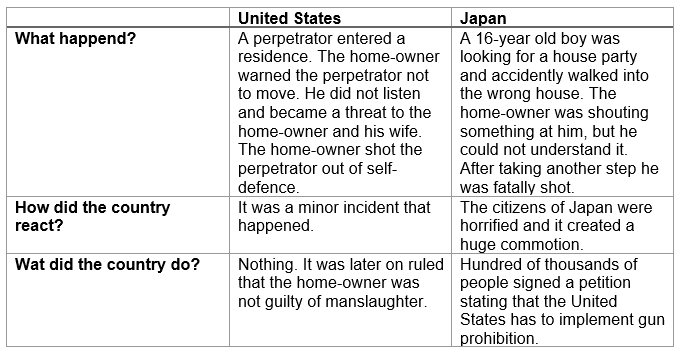 This example clearly highlights the differences on how incidents involving guns and death are perceived by the two countries. Okay, but how is this even possible? We know after WWII they no longer wanted to be associated with violence. But where does their apparent aversion to guns come from? Let’s look deeper into that. Did they give up their guns because of the number of deaths? Was it because of fear of the power of a gun and what it represents (the ability to harm or take a life)? Was a patriotic move – a way to try and save their nation? It is not exactly clear why, but it is likely a combination of all these factors. The aversion to guns may stem from the simple fact that there is almost an entire generation that did not grow up around guns and therefore does not feel comfortable around them. If you were to ask a Japanese 18-year-old: ‘What do you think about guns?’ – they would likely tell you that it is to go hunting and hunting only. This generation does not associate guns with self-defence and for them guns are not an item of self-defence, nor something they want around them. Okay, but even if the majority of people does not want or feel the need to have a gun, how easily can a Japanese citizen acquire a gun? Well, not so easily at all. Let’s take a look at the Gun Control Legislation of Japan. There is no minimum penalty for unlicensed firearm possession, but if a Japanese citizen has an unlicensed firearm it is likely (81%) they get a sentence for illegal firearm possession and are imprisoned for a year or more. The maximum penalty is 15 years in prison. Firearms and Swords Control Law: The restrictions of owning a gun from the first category are stated in this law. Besides owning a gun in the second category is prohibited. the Explosives Control Law: This law regulates the manufacture, sales, stockpiling, transportation, consumption of explosives. the Customs Law: Import of handguns, military rifles, machine guns, guns and their ammunition and parts is prohibited. Foreign Exchange and Foreign Trade Law: This law controls and coordinates external trade, this is the basic law of Japan’s external trade. To give a better insight in the matter, here is an example. In the Unites States there are shooting ranges where ‘tourist’ can fire a few rounds with guns. Japanese tourist who fire a few rounds would be breaking three separate laws back in Japan. One for holding a handgun, one for possessing unlicensed bullets, and another for firing them. The first one alone, is punishable by one to ten years in jail. Another example: small-calibre rifles have been illegal to buy or sell since 1971. If someone owned one before then they were allowed to keep it, once the owner of the rifle dies the gun has to be turned over to the police. So, what influence have these laws had on Japan? For example, when was the last mass shooting? The last big shooting took place on January 12th, 2010. The attack was carried out by 49-year-old Yasuhisa Sugiura. He was a government employee in Japan’s second-largest city Osaka. According to police, he was involved in a “troubled marriage” with a 48-year-old woman. He killed three people (his mother in law, the owner of the establishment where the shooting took place and an employee of the establishment) using a rifle and committed suicide afterwards. After this the Japanese government took no further action, since it was not considered a terrorist attack and stricter gun laws would have not helped to avoid this rare incident. And what about America?They probably had an incident very recently. But first what is the problem in America? 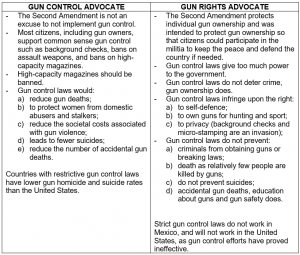 Looking at the United States – what are the gun control issues? Following the Christchurch mass shooting in New Zealand, the country began to pass laws and policies making their already tight gun control policies tighter. This has never happened in the US following the many, many mass shootings that occur in the country, and is unlikely to happen any time soon. But why? Let’s take a look at and evaluate why gun control policies are practically inexistent in the US and why. 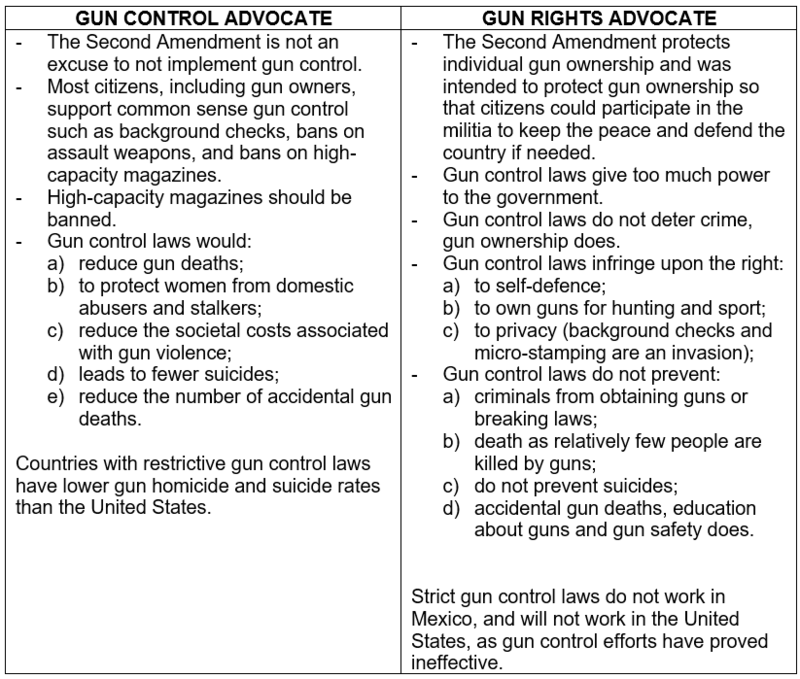 Gun rights advocates -> support decreasing regulations related to gun ownership. U.S. civilians own 393 million firearms, and almost half (35% to 42%) of the households in the US have at least one gun. 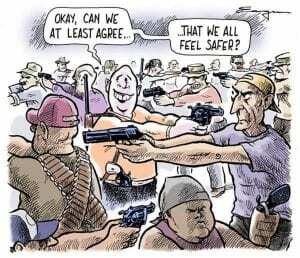 There are 5 guns for every 100 people in the US, the highest estimated number of guns per capita. Now, it is clear that America is  gun loving country. But does that mean that they are against gun control? Not really. 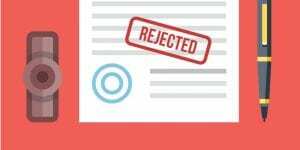 Stricter gun policies are not necessarily unpopular, and according to Gallup 61% of Americans thought gun laws should be stricter. Support for specific measures that restrict access to guns is even higher with Americans supporting background checks for all gun sales, including private exchanges between individuals, and a national gun ownership database. So why aren’t there gun control policies in place? Well, because of two interlinked factors. First what is known as the enthusiasm gap and second the NRA’s powerful interference in US politics. The enthusiasm gap only highlights that gun owners and gun rights activists have simply been much more activated by gun-related issues than supporters of stricter firearm laws. If you want to know more about the NRA watch this video -> “How the NRA hijacks gun control debates” (STRIKETHROUGH S3-E5) by Vox Media Inc. The NRA also takes advantage of the US’s unique legal environment – America acknowledges an individual’s legal right to own guns, through the Second Amendment in the US Constitution. If you want to know more about the Second Amendment watch this video -> “The Second Amendment: How the gun control debate went crazy | Kurt Anderson” by Big Think. And even if a president, or anyone for that matter, attempted to enact stricter gun laws, they would probably fail. Why? Because of how the US political system is structured, with multiple checks in the system presenting several veto points to just about any legislation. Basically, for a bill to become a law, it has to get majority approval from the House and Senate – which is tricky because it’s not a representative body (each state has equal representation, regardless of population). Then there is the filibuster which requires most legislation to get 60 out of 100 votes, instead of a simple majority. And then, of course, the president could veto the bill anyway, which Congress can only overcome with a two-thirds vote. This makes it nearly impossible for gun control policies to be put in place, as there are too many points at which the bill can fail. 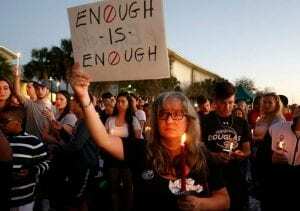 The US legal system may be to blame for making it harder to pass gun control bills. But surely there is more to this matter right? Let’s have a look of what opposing sides of this debate have to say on the mater. Essentially, gun control advocates are guided by common sense and understand that gun control legislation would be of benefit to the country. Gun rights advocates on the other hand stand behind false facts and a very old piece of legislation that gives their cause legitimacy. 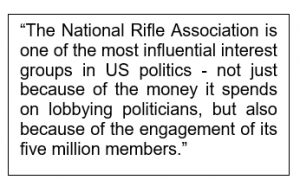 In reality there is not more to this matter than exactly that, gun rights advocates have a legitimate claim despite their false facts and therefore make gun control advocacy and legislation very very hard. 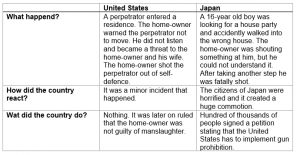 Let’s compare how both countries reacted to the incident – where a Japanese 16-year-old boy was shot after entering the wrong house in the United States. The table above only serves to highlight how each country perceived the incident the impact it had. What works for Japan will probably not work for the United States. The countries are starkly different. The Japanese grow up with the belief that guns are “bad”, whereas the youth of the United States grows up with or around guns. After every big incident that happens in Japan the government takes actions, the United States does not. The United States benefits from the gun industry and will probably therefore not make it illegal to own a gun. Imagine something bad happening to your loved-ones, and nothing has been done about it. You would like the help as well right? You can give that help to people who need it, to make for instance the United States a country with a better gun policy. But it is not only the United States. It is believed that the gun violence only happens far away from you, but is that really the case? No. In today’s world, and with the help of social media and technology you see gun violence and its effects from anywhere in the world. And no one wants to see yet another mass shooting that killed innocent people. Take for instance what happened in New Zealand recently, one of the safest countries in the world. The shooter drew inspiration from white nationalist rhetoric of America. This means, anyone, anywhere, can get inspired by anything, and if they decide to act violently and have access to guns? They may a mass shooter, and they may be close to you. Have gun owners lead the way in preventing gun suicides. If you are in the US there is also a number of petitions you can signs and protests you can join in and attempt to mobilize the government to enforce some gun control laws.